DGTL kicks off the festival season with their annual weekender during Easter. DGTL returns to the Amsterdam NDSM-docklands for their annual weekender during Easter 2019. The sustainable festival organisation will, traditionally, open the festival season and will treat national and international audiences to music, art and revolutionary sustainability projects on April 19, 20 & 21. 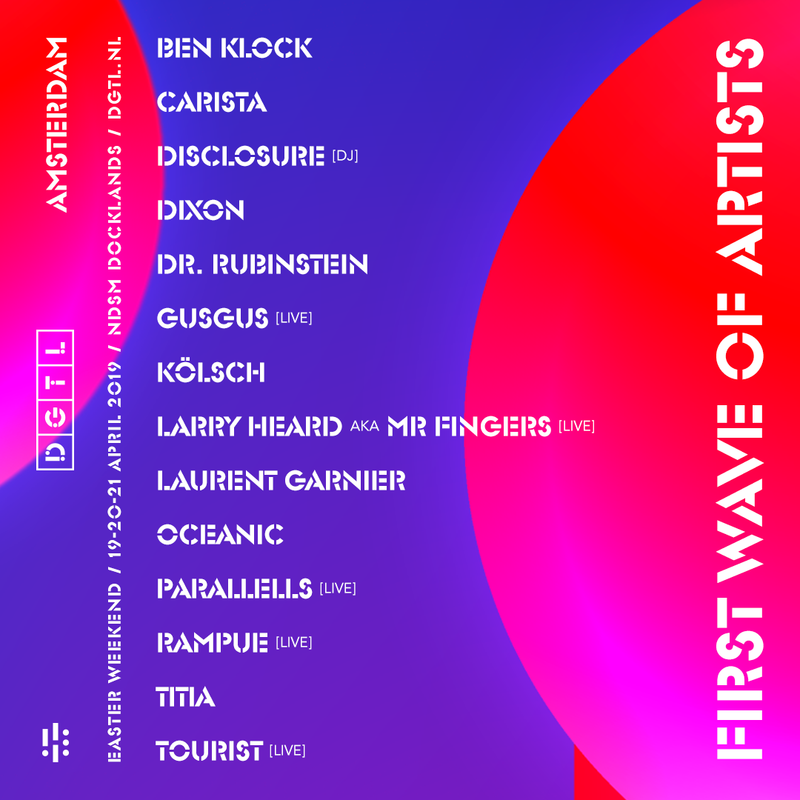 The first names of the Amsterdam 2019 line up are revealed and once againDGTL shows they’re at the forefront of electronic music festivals in The Netherlands. The special act this year is DJ-duo Disclosure (DJ-set) who are well-known for their hits ‘Latch’ and ‘You and Me’. Also heavyweights Ben Klock,Dixon, Kölsch and Laurent Garnier will make an appearance at the acclaimed festival. As always, live performances are an important part of DGTL’s billing, hence GusGus (live), Larry Heard aka Mr. Fingers (live), Rampue (live) andTourist (live) being amongst the first names announced. The organisation will also showcase local heroes Oceanic, Carista, Titia, and stars in the making such as the Amsterdam duo Parallells (live) who will make their debut at the festival this year. Knowing that this is only a glimpse of what DGTL has in store, with so many artists still to be announced, it’s safe to say; DGTL AMS 2019 is a festival that is not to be missed. The festival organisation, who are currently Amsterdam’s most sustainable entrepreneurs, have a mission to become the world’s first circular festival by 2020, which includes being completely waste- and emission-free. Huge strides have already been taken to achieve this goal. DGTL has many editions around the world, including Barcelona, Madrid, São Paulo, Santiago and Tel Aviv where sustainability also plays an important role. With this, the organisation hopes to be an example for the dance industry and other festivals worldwide. DGTL’s full line-up will be announced on January 8. The passepartouts (from €130,- includes Friday opening night, Saturday, Sunday and night program) and weekend tickets (from €82,-) for DGTL Amsterdam 2019 are now on sale. Separate day- and night tickets will be available on January 8.